Margaret E. Roberts is an Assistant Professor of Political Science at the University of California, San Diego. Princeton University Press: As authoritarian governments around the world develop sophisticated technologies for controlling information, many observers have predicted that these controls would be ineffective because they are easily thwarted and evaded by savvy Internet users. In Censored, Margaret Roberts demonstrates that even censorship that is easy to circumvent can still be enormously effective. 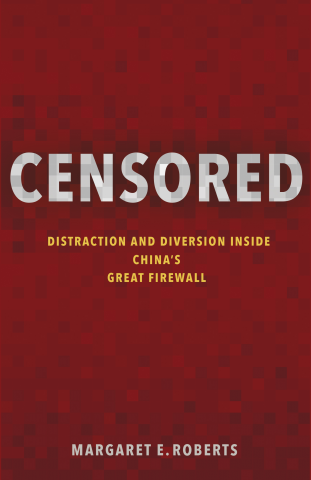 Taking advantage of digital data harvested from the Chinese Internet and leaks from China’s Propaganda Department, this book sheds light on how and when censorship influences the Chinese public. Roberts finds that much of censorship in China works not by making information impossible to access but by requiring those seeking information to spend extra time and money for access. By inconveniencing users, censorship diverts the attention of citizens and powerfully shapes the spread of information. When Internet users notice blatant censorship, they are willing to compensate for better access. But subtler censorship, such as burying search results or introducing distracting information on the web, is more effective because users are less aware of it. Roberts challenges the conventional wisdom that online censorship is undermined when it is incomplete and shows instead how censorship’s porous nature is used strategically to divide the public.